The Destination ImagiNation Team Challenge is a Challenge teams work on over a long period of time, usually several months. This year, Destination ImagiNation® presents seven Team Challenges (six competitive Challenges, and a Rising Stars!® non-competitive Challenge), and each team generally chooses one Challenge to solve. A competitive Challenge is made up of two parts, the Central Challenge and Team Choices (except for a yearly Improvisational Challenge, which does not include Side Trips). Purpose: Encourages development of Creative Problem Solving techniques, teamwork, and creative process over a sustained period of time (usually several months). Educational Focus of Central Challenge: The project undertaken by the team is academically based and focuses on one or more of the following areas: Technical/Mechanical Design, Scientific, Structural/Architectural Design, Theatrical/Literary/Fine Arts Elements, Improvisational Techniques and Service Learning. Each of the six competitive Central Challenges involves a research component. One or more of the Central Challenges involves an international and/or intercultural theme. Purpose: Encourages participants to discover and showcase their collective interests, strengths, and abilities as a team and as individuals, and allows them to develop that showcase over a long period of time. Educational Focus of Team Choice Elements: Based on the educational theory of multiple intelligences, which in part emphasizes allowing participants to find their own best ways to present what they have learned. Allows teams total freedom to develop elements of their own choosing. Allows teams to highlight areas of strength that are not brought forth in the Central Challenge requirements. Allows/Encourages teams to recognize and make the most of each individual’s abilities/interests. The Destination Imagination® Instant Challenge is a Challenge teams are asked to solve in a very short period of time at their Tournament, without knowing ahead of time what the Challenge will be. Purpose: To put team’s creative problem solving abilities, creativity, and teamwork to the test in a short, time-driven Challenge. 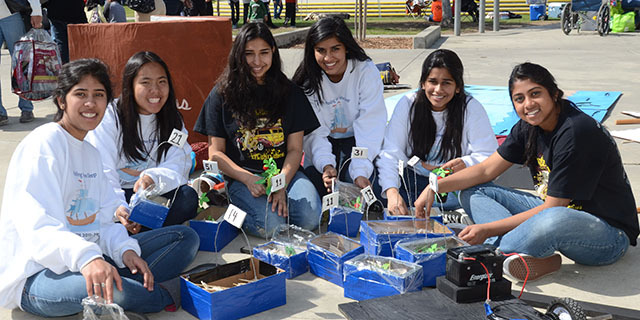 Educational Focus of Instant Challenge: The team’s use of creative problem solving strategies, assessment and use of available materials, and teamwork under tight time constraints. Encourages teams to develop creative problem solving and time management strategies, performance and improvisational techniques. Develops the ability to quickly assess the properties of provided materials, and learn how to creatively manipulate materials for a unique solution.